I’ve been practicing reading Greek fairly regularly all year. Hebrew had fallen a bit by the wayside until recently. As of the last two weeks, however, I think I’ve got a good rhythm now for keeping both fresh. I know I’m not the only pastor who finds it a challenge to not lose the heard-earned results of semesters and years of Greek and Hebrew in the classroom. 1. 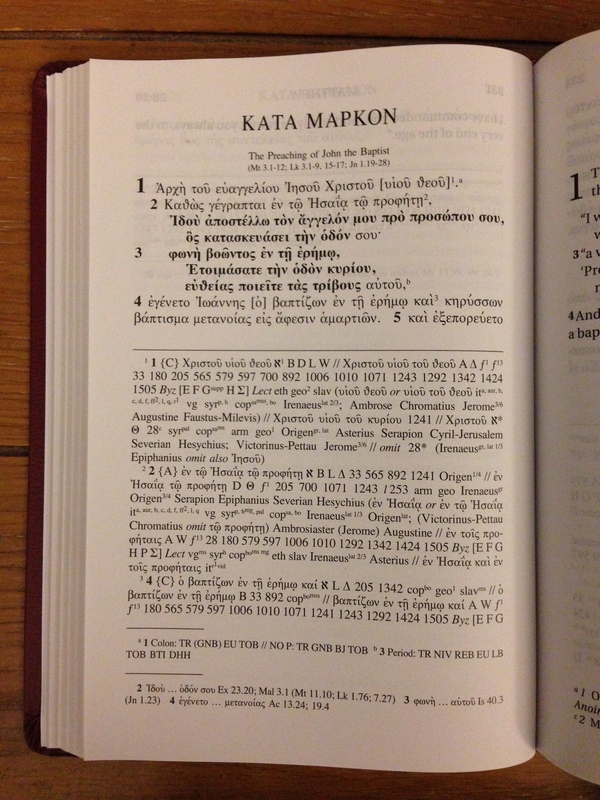 Reading through the Greek New Testament, roughly a chapter a day. To become more fluent in reading, there’s no substitute for… you know… reading. I just got through 2 Corinthians, which I think might be the most difficult book in the New Testament—in both Greek and English! 2. Working through the Baylor Handbooks. Baylor’s got two solid series in progress: Baylor Handbook on the Greek New Testament (BHGNT) and Baylor Handbook on the Hebrew Bible (BHHB). These are books to read cover to cover, especially when you want to move from “rapid reading” to more detailed analysis of the text. 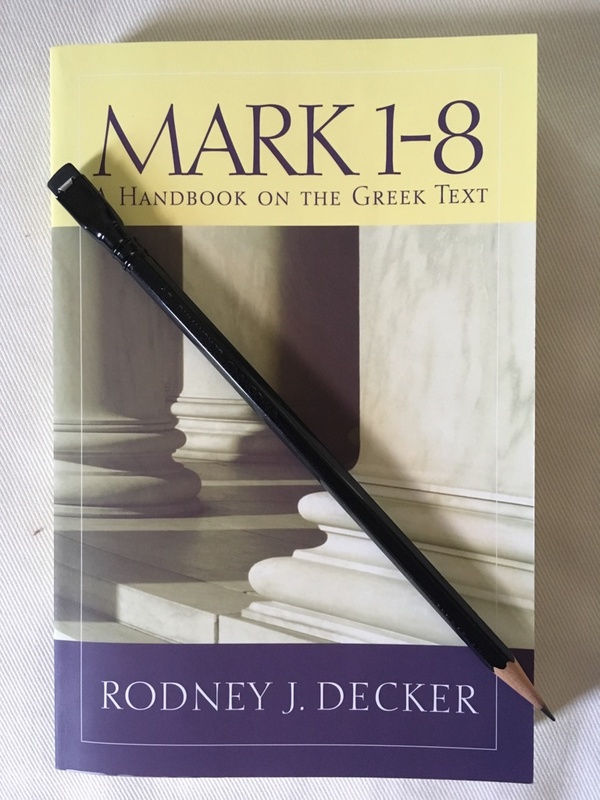 I just finished Jonah and have started in on †Rod Decker’s Mark. You can see more about the series in my reviews of Luke and Malachi (here and here). 3. Reading my preaching passage in the original language, maybe even making my own translation. I just preached through Ephesians. I translated much of it as I studied the text—either typing it out or doing it in my head. Especially with Paul’s longer sentences and more involved lines of thought in the first three chapters, this was challenging, but also essential in my grasping the text. Now with the Old Testament lectionary readings in view (hello, prophets! ), I’ll have a chance to reactivate my Hebrew reading. If you (a) preach somewhat regularly and (b) want to make use of your Greek and Hebrew, why not combine the two endeavors? Both your preaching and your languages will be the better for it. 4. Reading Greek with another person. I’m really fortunate to have a reading partner for #1 above, reading through the GNT. This is an immense help and likely deserves its own post. Just remember that skill-building often happens best in community. 5. Learning to enjoy reading Greek and Hebrew. Lack of proficiency for me is a great way to not enjoy a task; conversely, the more I read, the more comfortable I am with the text (Galatians was almost easy after 2 Corinthians!). Reading the Bible in its first languages also forces me to slow down and carefully consider what I’m reading. Greek and Hebrew reading fit well into devotional practices. (Great book on this, by the way, here: Using and Enjoying Biblical Greek: Reading the New Testament with Fluency and Devotion). How about you? If you’ve been keeping your Greek and Hebrew active, what’s been helpful? What pitfalls are you facing? What other resources should I and others like me be using? My Greek teacher told us after completing our readings in John that unfortunately this experience will be the highlight of many of our Greek competencies. At the time, I thought he was wrong in his assessment. Sadly–at least for me, that was a correct prophecy. And although I utilize the original text from time to time in studies, I don’t do what you are doing. So your post was both humbling and encouraging–and to know that those how hear you each week are quite blessed to have “a workman who does not need to be ashamed” of his hard and fruitful labor in the Word. Blessings! Thanks for your kind words, as always! Glad you took some encouragement from the post. I was just reading back through some old seminary notes where a Hebrew professor inspired us by saying even *3 minutes* of Hebrew a day would be enough to keep proficiency up. I tend to go for an all-or-nothing approach, which is to my detriment. So smaller steps (12 verses day, or 5) can sometimes be better.